In the once-lush fields of South Australia, on land that borders the state's world famous Lower Lakes, farmer Nigel Treloar rounds up the herd with the help of his off-road motorbike. It is one of the few things that has got easier as a result of Australia's worst drought in 100 years. That is because he used to have 800 cows and now he only milks 250. There is not enough irrigation water from the nearby lakes to sustain a bigger herd. Nigel took me to nearby Lake Albert, to what used to be a vast expanse of water. But now its waters have receded and much of it resembles a moonscape. The pump and pipeline that once irrigated his land now lie in the open-air rather than underwater. He has been chasing the retreating water and has been losing the race. "We'd be up to our waist in water here and it would be navigable," Nigel told me, after we had walked out 100 metres from what used to be the shoreline. "You could come out here with boats. All the fishermen would be up and down with their fishing gear and pulling in the catch." "But this is the middle of winter and it looks like a desert." There are puddles of water but they are brown-tinged and unwelcoming. The cows will not drink it. So high is the salt content that it stings and burns their mouths. The Lower Lakes lie at the end of the Murray-Darling basin, and are world famous for their ecosystem, with their long-neck turtles and pelicans. 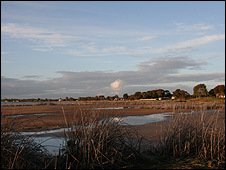 The area was popularised by the 1970s film, Storm Boy, and supports the world's largest breeding colony of Australian Pelicans. I managed to walk out to an island in Lake Albert where the pelicans have been breeding for centuries. Now their nests lie deserted, because there is no water left to protect them - and foxes are on the prowl. 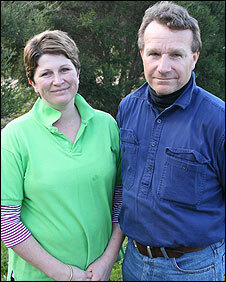 "This area is on the very brink of environmental collapse," said Nigel's wife, Melanie. "You only have to look around to see that." "You see the lack of birds and the lack of life. You smell it. You can smell the water. If you walk out into the lake bed you can burn your feet because of the acid sulphates." "It's very real and it's happening right in front of us." In recent years, the number of farms in the area has dropped from 55 to just 10. Brad Fischer is a third generation farmer whose family has recently sold off its entire, award-winning dairy herd. "To see my parents on the day that the animals left… All they could see was everything that we've worked for for 30 years going down the track. It's also my future going down the track." "We could have held on, but we did it for the benefit of the cows. We just didn't want to put them through it. The cows spent more time dealing with the salt in the water than producing milk." The Big Dry - Australia's worst drought in 100 years - is only part of the problem. The decades-long mismanagement of the Murray-Darling River basin has exacerbated the dry conditions. 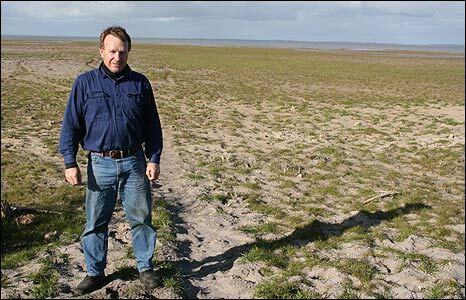 The water in the basin, which irrigates Australia's food bowl, has been over-allocated. Farmers all along the Murray-Darling have purchased and were promised water allocations that the river system simply can no longer sustain. A 20% reduction in rainfall leads to a 70% reduction in stream flow. Since the Murray-Darling runs through four states - New South Wales, Queensland, Victoria and South Australia - each one has fought hard for its share of the water, often at the expense of the needs of neighbouring states. Naked self-interest has often reigned. It was not until 2007 that the Howard government decided to take national charge of the river system. "It's been a disaster," according to the global warming activist and best-selling author, Professor Tim Flannery. "We managed to unify the railways shortly after federation but it's taken us a century to do anything about water. And it's still extremely difficult because the water in those river systems is over-allocated, it's a 130% allocation, and that was in a good year. "So when we're facing a really serious water deficit, there just isn't any water any more." Early in August, Water Minister Penny Wong said that the lower lakes were beyond salvation, a statement that enraged farmers and environmentalists. Stung by criticism that the government was not doing enough to save the lakes, Prime Minister Kevin Rudd has since decided to beef up a buyback scheme, the aim of which is to purchase water allocated to irrigators further up stream. A pipeline to bring water from further up the Murray is also planned. But it will not be built for a further two years. Though an optimist by nature, Tim Flannery paints a bleak picture. "We are now looking at a situation where we could either have an Aral sea or a series of acid lakes. The options we have shrink by the week because there's less water in the system. Look, things are really grim." On Tuesday people living along the Murray-Darling basin tell the BBC of their concerns over water usage.